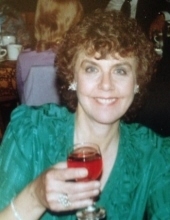 Liz Ayers, 86, passed away on April 1, 2019. Elizabeth Ann Fuerth was born in Cape Girardeau, MO. She lost her mother, Elizabeth Virginia Ellis Fuerth, at the age of six, and was raised along with her sister, Emma Louise ("Weezie" to Liz's "Sanny"), by their father, Paul Fuerth, with a great deal of help from their aunt, Lucille Fuerth. Liz was preceded in death by her husband, Don, in 1996. She is survived by her children, Paul Ayers, Daryl Ayers, Jane LaTorra, Barbara Swadley, Thomas Ayers (Cathy), Renie Herrin (Jeff), Travis Ayers (Jennifer); 12 grandchildren: Dylan LaTorra, Erin LaTorra, Rachel Swadley Kisselman (Seth), Evan Swadley, Claire Swadley, Amy Ayers Murray (Ryan), Jill Ayers, Nicole Herrin, Sage Herrin, Dalton Ayers, Lauren Ayers, Darcy Ayers; and 2 great-grandchildren: Axel Kisselman and Everly Kisselman. She graduated from Southeast Missouri State College (now University) (SEMO) with a bachelor’s degree in English; a subject Liz was passionate about her whole life. She worked briefly at the Pentagon after college. She married Donald Ayers on September 6, 1954 in Cape Girardeau, MO. They went on to have seven children. Don’s job with the FBI took them to a few different states, but they eventually landed in Arvada, CO where they resided from 1967 until their deaths. Besides being a devoted, amazing, mother to all of her children, Liz was an accomplished pianist, gardener, and quilter. She had a love for classical music, and for many years sang in the church choir. She gave her first organ recital at St. Vincent's Catholic Church in Cape at the age of six. Liz was the fastest typist this side of St. Louis. She was known as the friendly grammar cop and proofreader. She was an avid reader—always reading the newspaper daily as well as numerous periodicals. Liz will be honored by her family with a private ceremony. She will be dearly missed but not forgotten. The family wishes to thank Sloan’s Lake Rehab Center and The Denver Hospice for all of their support and care during Liz’s time of need. To plant a tree in memory of Elizabeth Ayers, please visit our Tribute Store. "Email Address" would like to share the life celebration of Elizabeth Ayers. Click on the "link" to go to share a favorite memory or leave a condolence message for the family.